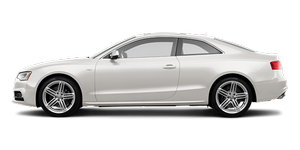 Comfort, Auto and Dynamic modes are part of the S5's optional Audi Drive Select system, which our test car had. ADS allows drivers to toggle the aforementioned transmission response among the three settings. You can do the same with accelerator sensitivity, steering response and the firmness of the S5's optional adaptive suspension. Changes between the ADS settings are difficult to detect across suspension and accelerator settings, but ride comfort is generous in any case. Over broken pavement, however, I noticed more cowl shake than I did in the A5 convertible we evaluated last fall. Characteristic of an Audi, the S5 in Comfort mode takes light effort to steer at low speeds — but it feels too artificial, never unwinding to center as naturally as I'd like. On the highway, the wheel seems a bit loose, requiring too many minor corrections to stay on track. Auto or Dynamic settings remedy much of this: The wheel takes on a firmer, more secure feel at high speeds, and there's more feedback from the road. The wheel requires more effort to turn at low speeds, but on curvy roads it rewards drivers with confident precision that's easy to fine-tune. Still, the S5 feels a bit nose-heavy compared with the A5. Audi's rear-biased Quattro — with an optional rear differential that routes more power to the outside wheels during corners — can't mask the extra drivetrain weight up front, and the S5 feels more prone to understeer than the remarkably neutral 2.0-liter A5.